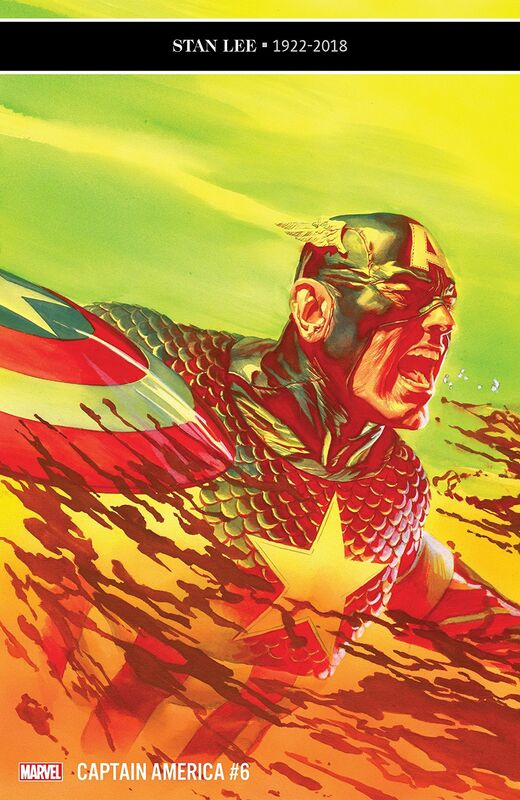 Captain America #6: Not so enchanting – AiPT! In a surprising drop of quality, the pacing, dialog, and characterization devolves into a stagnant, blunt puddle. Tapping one of the most well-regarded, modern civil rights activists to write Captain America was a bold move, but an excellent one. Ta-Nehisi Coates’s take on the star spangled Avengers has been a challenging dive into how America’s flagship hero fares in very unpatriotic times. Yet, this issue sadly subverts the tight pacing, evocative themes, and strong characterization it previously held for something more long-winded and far less evocative. In #6, Alexa, who just brought back her lover, Aleksander, drones on and on for 20 pages about how bad the capitalist pigs and that accursed Steve Rogers are. In previous issues, we were given short, but to-the-point comments from the baddies about their beliefs, which were effective in those small doses. No such brevity here. A main overall problem of Coates’s writing rears its head here–all of the characters talk in the same, overly ponderous, regal manner, spouting hilariously corny lines we’re supposed to take at face value, such as: “The air, my dear. The free air. It’s…enchanting. Almost as enchanting as you.” Or how about: “My life…is forfeit without him. The grief overawes me like a wave.” One more, I promise: “Power that did not boast–that wore no rude colors. Power that simply was.” How did these get past the editors? In order for characters to have personality and stand out from each other, thus generating conflict, they shouldn’t all sound like the writer trying to be clever. Much of this issue centers on a flashback where Alexa finds the unkillable Rasputin (Alex Grecian and Riley Rossmo should sue), prompting loads of exposition. By the end of the scene, we realize Rasputin wasn’t even necessary to the actual narrative, and furthermore, seeing Rasputin hiding with a bunch of glowing zombie skeletons seems a bridge too far for this fairly grounded series. Thankfully, the villains do end up delivering a pretty decisive blow against Cap that I won’t spoil (although we’ve seen the fallout a thousand times before). But the game-changing ending only highlights how unnecessary the previous pages are. Leinil Francis Yu’s art is average, but certainly not his best. Granted, the script doesn’t give him much to work with. He skimps a little too much on backgrounds, although his composition and facial details are still fetching. The ending is a bold move. The ending is bold--but cliche.